You will remember me saying back in this post that I had recently had some delicious bircher muesli while in the Hawkes Bay. 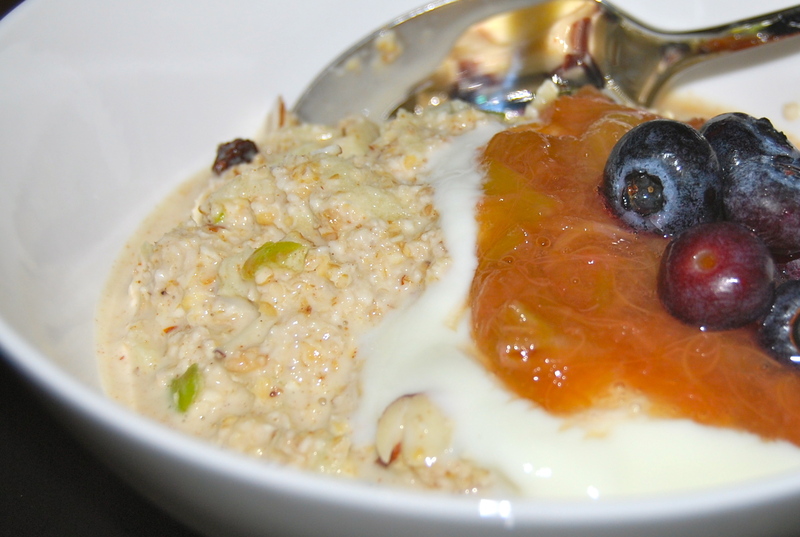 I came back home determined to try making my own as it’s a delicious alternative to regular muesli or wintery porridge, but just as filling and if not more tasty! Well, I’ve made it twice now and both times we really enjoyed it, though I think my recipe improved the second time as I adjusted the amounts of cinnamon and orange juice to get the flavour just right (to our liking anyway). Of course you can just use my recipe as a base and adjust the flavours and fruits as you like. We had ours with stewed rhubarb, fresh blueberries, yoghurt and honey. The muesli keeps well in an air tight container in the fridge for about 5 days (that’s if you can resist eating it all first!). Mix all ingredients together in a large bowl the night before eating. Store in a sealed container in the fridge. It’s that simple!